Despite a symphony of snores, farts and waves of rusting on sleeping pads among the twelve others in the Crosby Shelter last night, we slept hard and late. Much deserved. Around 3am I woke up realizing just how much of the “AT Experience” was about people; not the place. I came thinking I could capture the landscapes in paintings and provide a sense of the trail for others, but its actually the people that give the purpose and sense of community of the trail. The midlife art framer/drifter figuring out a new job, the young MIT theoretical physicist from Budapest, Hungary searching for a way to apply his thoughts and be happy, those awaiting deployment into the military in anticipation … they have one thing in common, they’re in some transition in life. They have a question; going deep into nature has an answer. Together in nature (and of nature), the trail is a living story of commonality and community truly making this “The People Trail”. So, if I really want to capture the essence of the trail, I need to able to capture the portraits of individuals and their story along with the landscape to make it complete. Especially Dee, who looked like a thin Gandolf from Lord of the Rings with his white beard and walking stick, but with an Indiana Jones hat, the epitome of a mountain man. 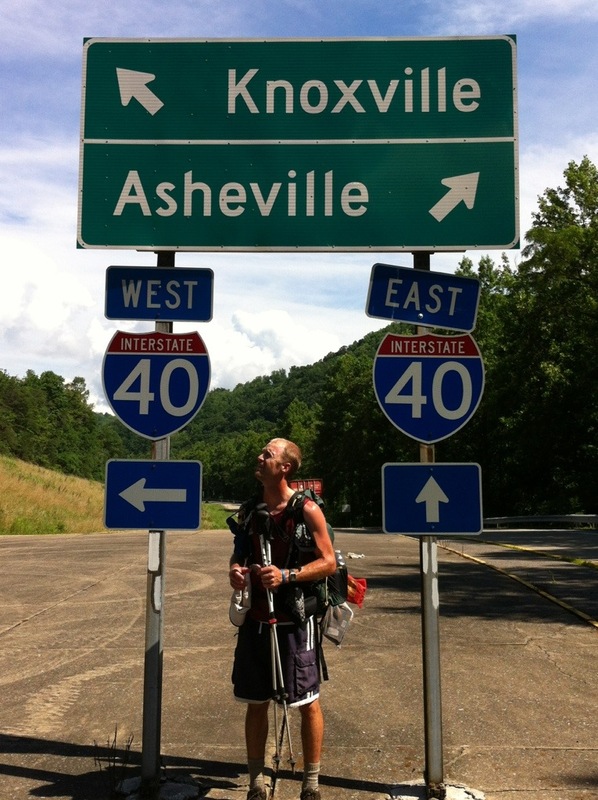 It was a short day (11mi) today leaving the Smokey Mountain’s northern edge and stopping at Standing Bear Hostel. That being said, we descended from 5000+ ft to 1900 ft, so we can feel our knees. 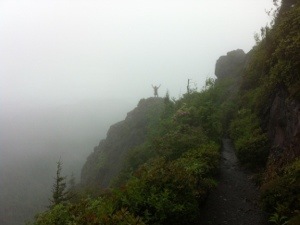 We passed Charlie’s Bunion and Littlefoot posed for what I hope will be a great painting (pic). Green Corner Road is a very beautiful area with rolling brooks alongside the road very much like Montreat, NC and the Standing Bear Hostel is a great hiker hostel. The people who own and manage it are right out of the “Duck Dynasty” show. The man who showed us around was shirtless, long haired and had a cigarette hanging out of his mouth, but he’s honest and treats us with respect as if we are welcomed into his home. I think there’s two “owners” and a lady that keeps the place up. The lady is likewise a very free spirit, announcing that she’s lost everything because she failed the last three drug tests (it could be the “bowls” she smokes). But she’s hilarious and not ashamed to be herself one bit, working a minimum wage job and enjoying being part of this little Standing Bear community. Rocket Man says,”If she gets too many beers in her, we’re likely to see her streaking acrost the place.”. Less beer, please. Seriously, a TV show producer could just record their conversations and they’d be an instant hit. It would be easy to write off these people as “weird” or label them as “hillbillies”, but the fact is they are just different (not a lesser part of society), and they aren’t labeling or judging us. We “AT Hikers” are definitely “weird” as well, often attracting clouds of flies, unshaven, and walking the roads to town hoping to hitch a ride. It’s easy to see those who looks down at us, dismissing us as repulsive as well as those with gentler eyes who show compassion and acceptance. They don’t judge, and that says something about their true character. Funny thing, Rocket Man walked by yawning in the morning while we were eating some breakfast and said,”I shore was surprised to see you left the doors open to the bunkhouse (where we stayed). Two big bears and a cub show up almost every night and I have to scare them off the porch.”. We had our food bags right next our beds. He then told us about the bear cub trying to get in his window one night and his lady friend insisted on him closing the window even though he was just trying to get the cat food. Gotta love how much character he has. I’d go back there easily just for the amusement even if I’m not hiking. I left one of my paintings tacked to the kitchen wall as a form of gratitude. Rocket Man, if you read this, thanks man! We’ll take off tomorrow heading toward Hot Springs, making it there in a couple of days. “Once you get over the hill, it’s not bad”, says another hiker here at the hostel. It’ll be hard to leave Littlefoot and Berg, my trail family this year. I hope we can stay I touch. No doubt I’ll always wonder how they are, as I do with my trail family from 2011 (Lala, Tall Tmbers and Firewalker). This year’s adventure had impacted me with a fresh perspective and appreciation of what is necessary for me to be happy. There are those things you need (shelter, food, water …), and things you can live without (luxuries). It’s amazing how many luxuries we have in our normal lives, how much energy we spend maintaining them and how much fear we have in losing them. We need so little to be happy, however, I’ve learned that walking “alone” in life is not an option for me. I need the companionship to have meaning and purpose. I’m not as independent as I thought. I need a trail family like Berg and Littlefoot. Without them, the trail seems empty. I also need to surround myself with others who aren’t judgmental, so I can feel free to become myself. Until now, I’d mistaken them for luxuries. Welding should be a great field to enter, as they aren’t the judging type. Priceless wisdom from the AT experience. Absolutely an awesome, thought-filled entry to your blog…….Wow! So proud of you!